Mildronate is an inhibitor of biosynthesis of L-carnitine by gamma-butyrobetaine (GBB) hydroxylase and as a competitive inhibitor of renal carnitine reabsorption. 4-Chloro-DL-phenylalanine is a selective and irreversible inhibitor of tryptophan hydroxylase, a rate-limiting enzyme in the biosynthesis of serotonin (5-HYDROXYTRYPTAMINE). 4-Chloro-DL-phenylalanine acts pharmacologically to deplete endogenous levels of serotonin. LCI699(Osilodrostat) is a potent inhibitor of 11β-hydroxylase, an enzyme catalyzing the final step of cortisol synthesis. H-HoArg-OH (L-Homoarginine) is an organ-specific, uncompetitive inhibitor of human liver and bone alkaline phosphohydrolases. (R)-Nepicastat HCl, the R-enantiomer of Nepicastat HCl, is a potent and selective inhibitor with IC50 of 25.1 nM and 18.3 nM for bovine and human dopamine-β-hydroxylase, with negligible affinity for twelve other enzymes and thirteen neurotransmitter receptors. Ro 61-8048 is a high-affinity kynurenine 3-hydroxylase (KMO) inhibitor with IC50 and Ki of 37 nM and 4.8 nM, respectively. 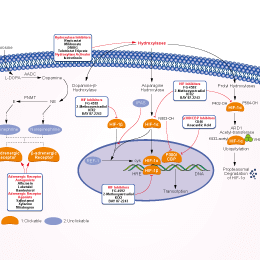 DMOG is an antagonist of α-ketoglutarate cofactor and inhibitor for HIF prolylhydroxylase. Telotristat Etiprate (LX 1606 Hippurate) is an orally bioavailable, tryptophan hydroxylase (TPH) inhibitor with potential antiserotonergic activity. Phase 3. Tetrahydropapaverine, one of the TIQs and an analogue of salsolinol and tetrahydropapaveroline, has been reported to have neurotoxic effects on dopamine neurons. It was developed to be used as a chemotherapy medication for the treatment of brain cancer, pancreatic cancer and more. Sapropterin Dihydrochloride, a synthetic preparation of the dihydrochloride salt of naturally occurring tetrahydrobiopterin (BH4), is a phenylalanine hydroxylase activator.